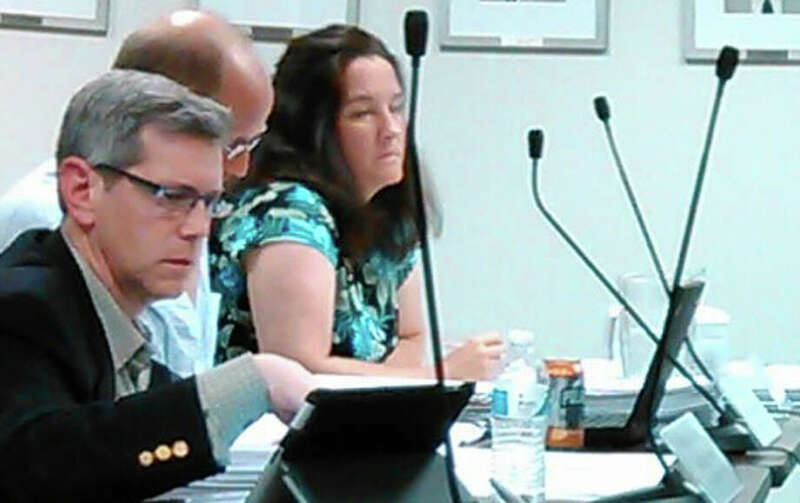 Board of Education members, from left, Marc Patten, John Llewellyn and Jennifer Maxon-Kennelly at Tuesday night's meeting in the Education Center on Kings Highway East. The $11.6 million plan to expand Fairfield Ludlowe High School and replace its roofs and windows is nearing the construction phase. Joe Costa, a principal at Perkins Eastman, an architectural firm in Stamford, told the Board of Education on Tuesday night that his firm in three or four weeks would submit construction documents to the state's Office of School Facilities in order to seek bids on the classroom and cafeteria additions. He said his firm on Monday received permission from the state office to go out to bid on the replacement of Ludlowe's roofs. "As we speak, that project is in bid, and we're hoping to get good numbers on that project," he said. A pre-bid meeting is scheduled for the roof project at 3 p.m. June 16 at the 785 Unquowa Road high school and bids are due by 11 a.m. June 26 at the town's Purchasing Authority in Sullivan-Independence Hall, according to the town Purchasing Department's website. Costa said all of Ludlowe's roofs would be replaced, except for the sections that had been replaced after damage caused by storms about 18 months ago. He said the roofs would be replaced this summer and next summer. Mark McCarthy, a principal at Perkins Eastman, said the classroom addition -- about 8,800 square feet and to consist of four general-purpose classrooms and two science classrooms -- would be built off Ludlowe's Webster wing. A science classroom would be on the lower level and third level and the four general classrooms would be on the second level, McCarthy said. A rooftop garden also is planned. The cafeteria addition would be built off the back of the building, and would have 515 seats to accommodate three lunch periods, McCarthy said. The addition also would feature a new seniors' lounge, which would be adjacent to the expanded cafeteria; faculty lounge, which will have about 50 seats; office for the school newspaper and yearbook, and storage area, McCarthy said. The town's Zoning Board of Appeals granted waivers related to the classroom addition's height and number of stories on June 5. The addition's height would be 33.85 feet, 1.85 feet more than zoning regulations allow, and it would have three stories, a half-story more than the regulations allow. Both the classroom and cafeteria additions require approval from the Town Plan and Zoning Commission, but an application had not been submitted to the town's Zoning Department for a TPZ public hearing as of Wednesday morning. The façade of the cafeteria addition will be similar to the existing building, McCarthy said. "It will really be a fantastic addition to the school, using a lot of the same materials," he said. "I think it will really blend in with the school in a nice way." Costa said Perkins Eastman would go to the Fairfield Ludlowe High School Building Committee on either June 18 or June 23 for approval of construction documents related to the additions and then back to the Board of Education June 24. The state would then hold its Plan Completion Test review July 8, Costa said. Costa said work to replace Ludlowe's windows is scheduled to take place this fall, with a PCT review at the state scheduled for Oct. 23. "All three phases will be under construction at the same time at one point or another but will be bid at different times," Costa said. Costa said he expected bids to come within the $11.6 million budget set by the Representative Town Meeting about a year ago. Enrollment at Ludlowe High is now 1,470 students, according to a May 1 count at the school, and is expected to peak at 1,587 students in 2020-21, according to a May 1 report from MGT of America Inc.